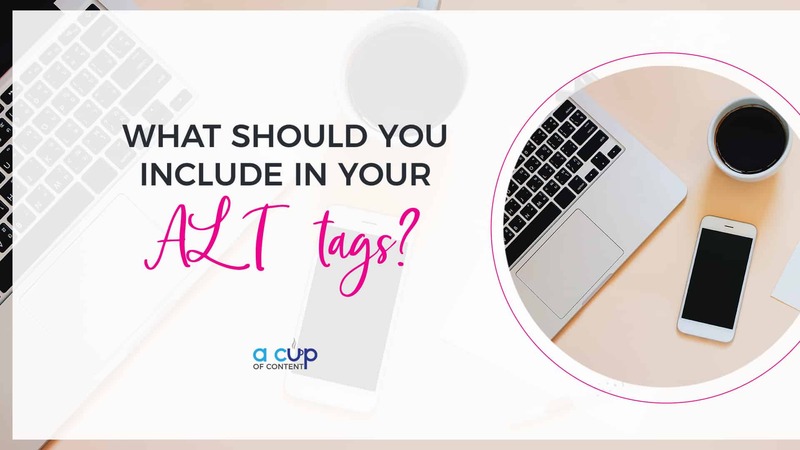 One of the first questions new members often ask me is “What are ALT tags?” While I go into a much deeper explanation in A Cup of Content’s membership, I thought it deserved a bit of explanation over here on the blog. 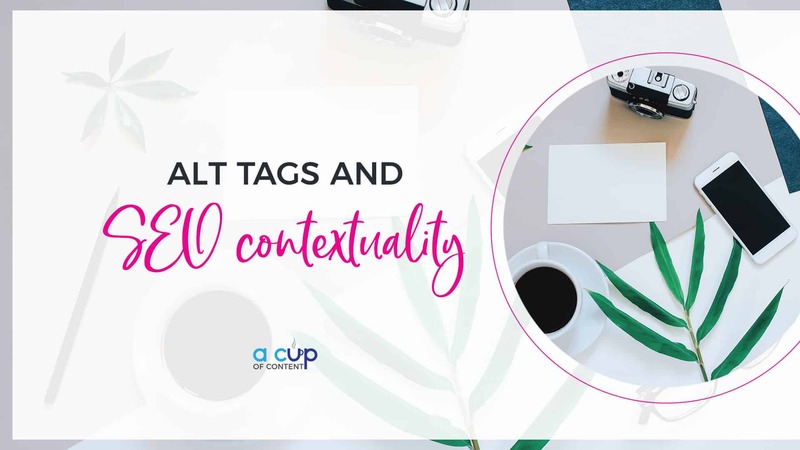 ALT tags are often referred to by several different names, like “alt attributes” and “alt descriptions” and even “image tags”. Essentially, they are all the same thing. At their bare bones, ALT tags are the written copy that describes an image to the internet and to those who are visually impaired. As businesses, we want to make sure that our ALT tags work for us in terms of SEO, or search engine optimization. 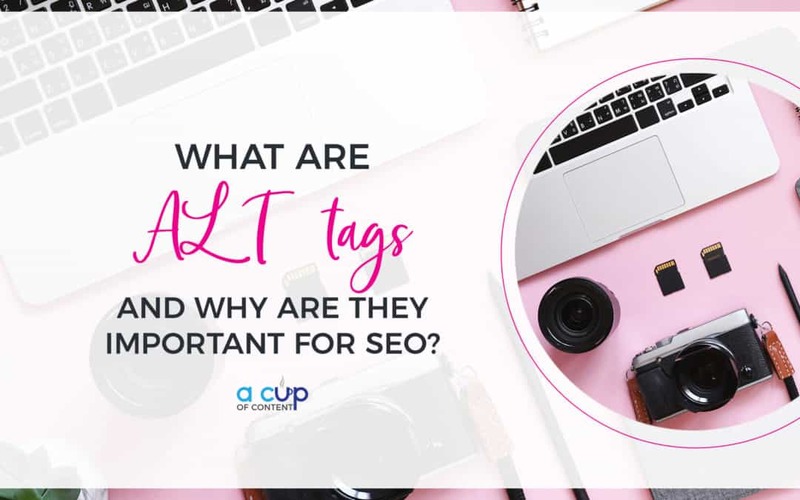 Know this: when you write an ALT tag for the images on your website, they should include the keyword phrase for the particular page the image is placed on. Every image on your website should have an ALT tag. What should you include in your ALT tags? You can include all sorts of things in your ALT tags, obviously, but you need to be careful of blackhat (or naughty) techniques that can get you in SEO trouble with search engines. Blackhat techniques can include keyword stuffing techniques like adding a bunch of keywords to all of your images. For example, I could easily add these keywords to every single image on my website: SEO, search engine optimization, learn SEO, what is SEO, and so on. But Google sees one image and thinks, “Well, how can that image possibly rank for all of those keywords? It’s just not possible. So let’s move them down the list.” Thus, my website gets moved down the list…based on an image. Granted, there are a lot of other factors that contribute to this. But chances are: if a website is trying to do this type of blackhat technique with an image, they are most likely doing it with every page on their website. A running theme I have throughout my membership is contextuality, and it’s with reason. We are long past the days of writing a blog post for the sake of writing a blog post. If you are posting content because you know you need to do it but you don’t know why you need to do it, then don’t bother. Of course, you want to write a blog post to make it interesting for your audience, right? But you also need to write a blog post for search engines. 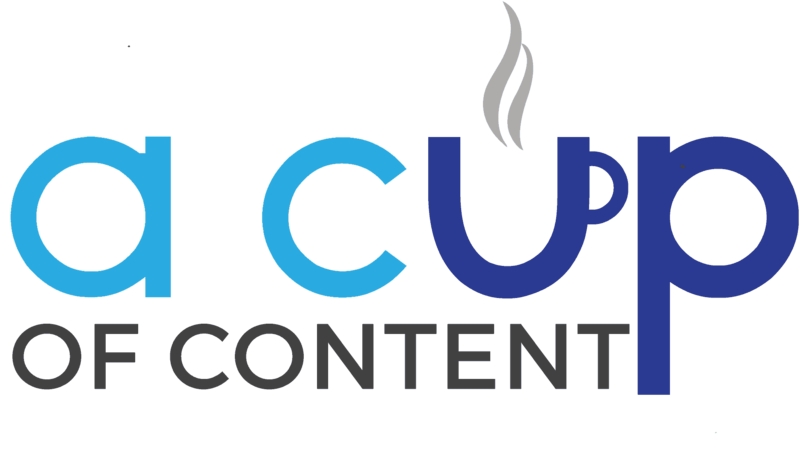 Many SEO companies who ghost blog (meaning they write blog posts for businesses and pretend to “be” the business when they write) are only writing content to help the business get found. The content is boring, dry, and chock full of keywords they believe will get the business moved up in search. But guess what? No one is reading that boring content. It’s so generic and boring and so far from who the business really is that it’s not driving traffic. It’s doing more harm than good. How can I learn to write like this, Kim? Well, you could sign up for our FREE trial and start learning. IT’S REALLY THAT EASY! I guarantee that in 14 days, you can learn something that will drastically change your business. All you have to do is get your hands a little dirty and try. You up for the challenge? Click that shiny pink button below. No credit card required. I triple dog dare you. 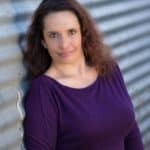 As a mental health therapist, my business has special marketing needs. Kim “got it” right away and was easy to work with as we developed content for website. She was very patient and really took the time to understand my business’s specific needs. Kim’s videos, blogs, and social media are full of information that remind you how important YOU are! It’s not only how important you are to your business—it’s that you are important because you can make your business into what you envision it to be. I now have all kinds of ideas, and Kim with her information has helped me get it into a user-friendly, client-centered format. My clients are now finding me on the web and liking and engaging with my Facebook posts. Kim’s information is easy to understand and implement for any type of business, and she is always client and customer-centered in her work.